According to the University of California at Berkeley, boiled eggs and beans are high-quality proteins to include in your diet. A hard-boiled egg offers many benefits because it contains carotenoids, riboflavin, vitamin B12 and selenium. Beans are loaded with fiber, phytochemicals, antioxidants and vitamins. A boiled egg and beans diet supplemented with fruits, vegetables, dairy, nuts and seeds provides a well-balanced diet for optimal health. Consult with a physician before making any dietary changes. In “What to Eat,” author Marion Nestle suggests hard-boiling eggs reduces your risk of consuming salmonella, a bacteria often found in raw eggs. Keeping your eggs refrigerated and cooking eggs thoroughly until yolks are firm prevents illness from bacteria. Hard-boiled eggs are fully cooked by layering eggs in a pan and covering them with cold water. Bring water to a boil, remove pan from the heat and cover for about 17 to 20 minutes. Remove and place eggs in a bowl of ice water before peeling. This method of cooking your eggs thoroughly reduces your chances of contracting salmonella. Eggs contain nutrients called carotenoids such as lutein and zeaxanthin. 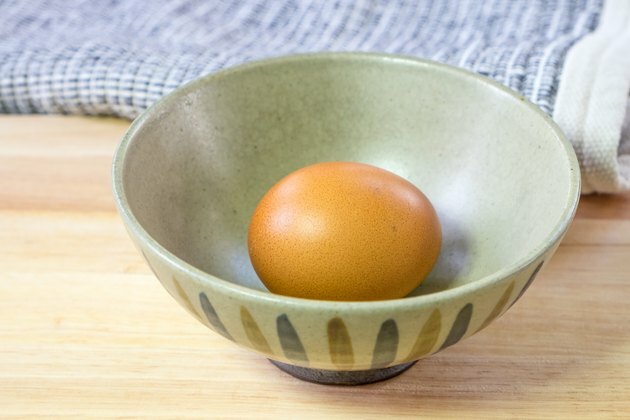 A large egg contains about 215 micrograms of these nutrients. Lutein and zeaxanthin are effective in promoting eye health by reducing the risk of age-related macular degeneration and cataracts. According to Dr. Jonny Bowden, together they filter harmful wavelengths from natural and artificial light. Carotenoids are better absorbed with fat and eggs offer about 5 grams of fat. The dietary fat found in the yolk of eggs is mainly saturated fatty acids. A diet high in saturated fats is often associated with health risks such as cardiovascular disease, stroke, cancer, obesity, high blood cholesterol and hypertension. The yolks of eggs are also high in cholesterol. The Reader’s Digest Association recommends eating no more than four egg yolks a week. This reduces your risk high blood cholesterol levels which increases your risk for heart disease. In “The 150 Healthiest Foods on Earth,” Dr. Jonny Bowden says fiber is a food component that has been associated with lowered risk of heart disease, obesity, diabetes and cancer. Fiber is slowly digested and provides sustained energy. This makes fiber-rich foods like beans an ideal food for diabetics and those who want to avoid spiked blood sugar levels. Eating fiber-rich beans and drinking adequate amounts of water helps to prevent constipation by adding bulk to your stools for easier elimination. Try different varieties of beans in your diet such as garbanzo, adzuki, black, cannellini, fava, kidney, mung, pinto and red beans. Beans are a good source of protein for vegetarians and anyone trying to avoid animal products. Protein is primarily composed of amino acids. Non-essential amino acids are produced within your body while essential amino acids need to be consumed through your diet. Beans are considered an “incomplete protein” because they lack certain essential amino acids. The University of California at Berkeley suggests combining beans with foods that offer the missing amino acids such as grains to make a “complete protein.” Try pairing black beans with rice or a salad with chickpeas and whole-wheat bread.